It's only 5:30 on Saturday afternoon — and it's already been a great weekend! The husband and I started out our Saturday with a family brunch meet up at Wahoo Decatur Grill. Our party of seven arrived at 11am, just as the doors were opening. If you haven't been to Wahoo for brunch — or dinner for that matter — I encourage you to. Great ambiance, interesting menu and solid service. With great choices from both the brunch and regular menus (plus a few brunch-time cocktails), all our diners left more than satisfied. I think the fan favorites were the salmon eggs benedict and the breakfast burrito (not pictured). The mimosas were especially tasty, too. Thanks for treating us, Dad and Susan! Then I was on to my favorite weekend sport: THRIFTING! Plus, Paul was in town and eager to check out the new Decatur Last Chance location. Last Chance moved last month from it's long-time post in Patel Brothers Grocery Plaza on Church Street. While I felt the new, smaller location (on North Decatur and Scott Boulevard) was cleaner and better organized, Paul missed the feel of the old place. In its new home, however, the second-hand deals are still alive and well. I was about five minutes too late to check out the shoes, as another shopper had just snapped up a pair of size 9, black snakeskin cowboy boots. When I complimented her find, she asked me my shoe size (usually 8.5) and told me she has a pair of slightly too small black cowboy boots at home — and asked if I was interested in them. I gave her my e-mail address and have my fingers crossed (e-mail me, Jenny!). While I usually don't try on pants (too much variation in waist sizes, lengths, fits, etc., that it's usually a poor use of time to try them on), I decided to take about 10 pairs with me to the fitting room. 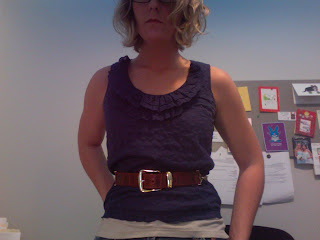 The odds were against me, but I managed to find a pair of great indigo-washed cropped jeans from Banana. Perfect fit! Score. I also settled on a lightweight, white button-up that I can wear with fun belts or over dresses. Double score. But the best was yet to come. Just when I thought my cowboy boot moment had passed, I spotted a pair of grey and cream-colored roper boots behind the counter, among the "premium" shoes. When the sales gal told me they were a size 7, my heart sunk. Regardless, I asked to try them on, hoping they were a men's or boy's size 7... and my hoping paid off. This sweet pair of boots fit great... AHHH! Awesome. What an awesome surprise to find the tags still on these things ($24.99 for me). After Last Chance, we hit up the Goodwill on Lawrenceville Highway in Lilburn (near the largest Hindu temple outside of India). This is where Paul hit the jackpot. He picked up two Polo shirts, an Izod polo-style shirt and a killer pair of navy corduroy Polo shorts. I snagged a purple boutique-style dress (tags on) that will be unveiled after it gets a minor nip/tuck at Sunny's alterations. If anyone loves funky clothes and jewelry as much as I do, it's Mb. 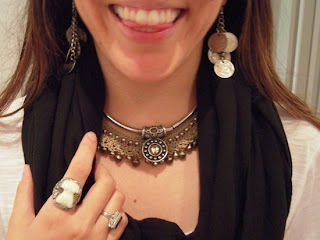 I favor necklaces and rings; she has a thing for brooches and bangles. Mb wore the elephant necklace out on Friday night and plans to bust out some of the pins this week. I hope she enjoys! I'm not going to lie... I almost kept the bull brooch and the elephant necklace. Today's post is dedicated to my friend Mb, who I visited this past weekend... and happy birthday, my dear! I had the greatest time in DC this past weekend! I stayed Friday, Saturday and Sunday nights with my friend Mb. She lives in Chinatown in DC proper, convenient to the metro and to all the cool parts of town. After sleeping off sushi, red wine and martinis from the night before (mmm Oya was delish), we ventured out to Adams Morgan to hit up the DC Vintage scene. I'd read in the DC Goodwill Fashion Blog that DC has quite a few awesome secondhand shops. With Mb and her friend Lauren in tow, I was destined to find good things and enjoy every minute of the journey. I have to say that our 45 minutes or so at Mercedes Bien was one of the highlights of the weekend. I enjoyed trying on various pieces (ranging from a polka dot jumpsuit to a belted, mod print dress) and watching Mb and Lauren sift through cool threads. I showed the sales girl photos from my blog and she couldn't believe what great stuff I've found on my home turf. Then somehow, I got into a favorite blogs conversation with a customer (Ginger of Booshie Design) and was asked to write down my favorite style blogs for the sales girl and for Ginger. (Shout outs to the AsianCajuns, Sally Jane Vintage and Love... Maegan.) Talking with them was a lot of fun. Later, we got to meet Mercedes herself — talk about fabulous. She was an incredible, eclectic, interesting, stylish character. The selection at Mercedes Bien is very well thought out and interesting. If I had big money to burn, I definitely would have bought vintage jewelry, dresses, sunglasses and shoes galore. Regardless, I was happy with my final purchase; I ended up snagging a mod-looking, black, elastic belt with a silver buckle ($18). Mb picked up a fantastic, vintage, green, belted skirt ($42). Meeps was also a lot of fun (and slightly less expensive) but I found the items slightly less glamorous and more costume-y. If you're looking for vintage t-shirts, funky pants and more casual wear, definitely check out Meeps. I came home to Atlanta with one other "new" item in my suitcase — a pair of cranberry-colored, peep toe, platform pumps that were too small for my dear friend. Her slightly larger foot is my gain (LOVE these shoes - thanks lady!). So last night, when I saw a girl walking into the gym wearing a pencil skirt, I felt inspired. I realized my pencil skirt needed to be dusted off — and it would be a great match for my "new" slingback pumps and elastic belt. Can you tell that I feel like a goofball? 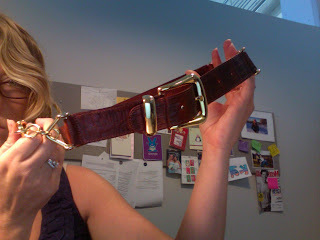 I picked up this "Extrovert" Italian belt at the LaVista Road (i.e. Northlake) Goodwill in Tucker last weekend when I was out shopping for my good friend Mb's birthday. (I'll post her birthday goodies later this week). I really lucked out on this trip, as I didn't notice the genuine leather belt hanging behind the counter — but the woman in front of me did. As she was trying it on, the cashier proclaimed it was half off today... and would ring up for $2.16. Fortunately for me, it was too small for the lady ahead of me in line — so I snagged it. 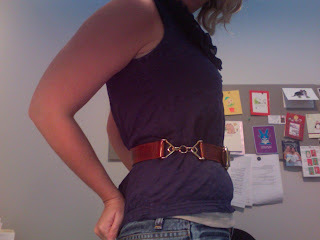 I love the gold buckle and the triangle-shaped buckles on the sides. And for $2.16!!! Let's not forget that part. Fiercely Awesome or... Glorified Pole Wear? You Tell Me! 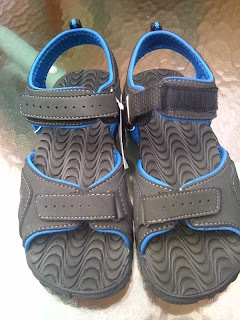 I bought these shoes the other night (cheap/fun) from NOW Discount Shoes. I figure that if I like them, I'll eventually get a nicer pair... or if I hate them, no big deal. What do you think? Cute? Stylish? Trash-tastic? Outdated trend? Somewhere in between? UPDATE (6/30/09): These shoes are pretty damn uncomfortable... and smell like gasoline. I'm not sure how many times they'll see the light of day. I did, however, get another/slouchier pair that I like a lot. Stay tuned! PLT and the Magic Wrap dress! 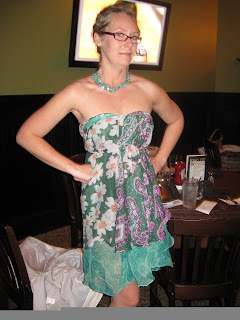 Well, "winner" Rosanne over at Pretty Little Tangents posted about her dress experience today! 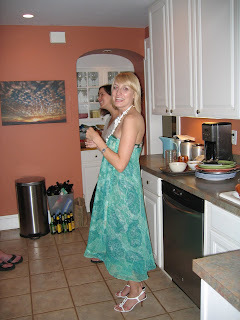 Rosanne sported the dress for a summer homecoming barbeque — and she rocked it pretty fiercely, if I could say so myself. Go visit her post and comment (by Friday) if you want to be the next to don the so-many-ways-to-wear-it dress. The premise is that if you win the dress, you have to wear it (and post pictures of yourself wearing it) then raffle it back off into the blogosphere... Could you be the next winner? And if you're crazy enough to want to buy one of these things, check out my original post for the eBay seller's info. And if you want even more, click here for photos of me and my coworker Laura testing out the dress contraptions. I have such a weakness for shoes. When out looking for a top or a dress, I can't help but browse the shoe section. Such was the case on Thursday when Maria and I hit up the Howell Mill Ross. I left with a cute, tiered purple dress and a pair of funky sandals. Maria snagged some red, patent leather sling-back heels by Guess and a pair of black Steve Madden flats with ruffles on the toes. She also got a really cute Bohemian-style dress and a cute but basic mauve-colored, strapless cotton dress. What I love about Ross is that they have such an interesting selection of items. Over the course of the last few years, I've purchased everything from green faux alligator loafers to skinny black jeans at local Rosses. (And if you know me, you've heard me say many a time that the Ross at North DeKalb Mall is the mecca of all Rosses — seriously check it out if you don't believe me — but do be warned the mall is a little sketch). Anyway... I digress. Here are the shoes I picked up with Maria on Thursday. They're a fun and funky summer sandal with a little bit of sass. and I even painted my toenails! Goodwill following the weekend's festivities. My younger brother just pointed me over to a blog I hadn't yet discovered. Let me tell you... the AsianCajuns are awesome! As long as these twin Asian Cajun girls are blogging, I'll be following. Thanks for the rec, Ben. sauces to choose from, including masaman curry, barbeque, garlic aioli, etc. On Friday night, I finally got a taste of Leon's Full Service. Accompanied by girlfriends Lauren and Ashley, I dined on pub frites (with the cucumber dill and goat cheese fondue dipping sauces) and the veggie loaf. We also grabbed beers off Leon's smart beer menu. I tried the St. Bernadus and the Lagunitas pilsner. Ashley and Lauren each tried both the Lagunitas and the Allagash white ale. While we enjoyed our beers, we all admitted to coveting some of the cocktails we saw our fellow patrons sipping on. I think my comments during veggie loaf eating were bordering (if not entering into) annoying, as I repeated over and over again, "OMG this is so freaking good." When the waiter came by, I told him the dish was "like crack." He and the gals all thought I said "like crap." Whoops. Not what I meant at all. Ashley seemed to enjoy her shrimp gyro and Lauren, her brisket open-faced sandwich... but not quite to the extent of my obsession with the veggie loaf. The menu has a strong variety of starters, sandwiches, full entrees and beverages. If you haven't already, you really ought to check out Leon's. If this isn't good review enough, I insisted that Dan go to the restaurant with me tonight. That's two visits in one weekend. Do the math. Okay, to call it a "rampage" is a little dramatic... but I've been busy shopping on Etsy lately. If you haven't checked out Etsy's offerings, you are missing out big time. From jewelry to clothing to home goods and other one-of-a-kind, handcrafted pieces — Etsy has it all. My shopping streak began with my hunt for father's day gifts. 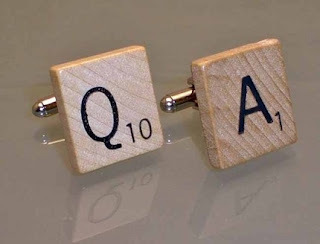 This year, I think that cufflinks would make a fun and interesting gift for both my dad and my stepfather. For my dad, Scrabble cufflinks. I custom ordered W and B for his initials. See the seller's store here. $13 plus shipping. 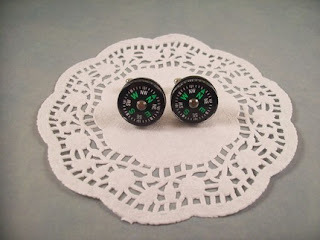 And for the camping-loving Tripp, compass cufflinks. $12 plus shipping. See other items by this seller here. 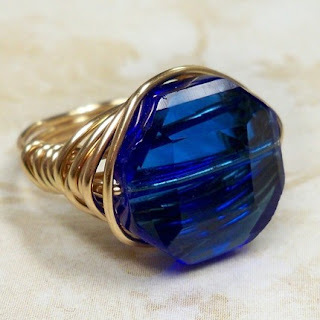 Blue glass ring for $9 plus shipping. See the seller's designs here. So fun! You. Must. Check. Out. Etsy.